“I have been a restaurant professional my entire life. I’ve had high levels of responsibility and have traveled extensively. 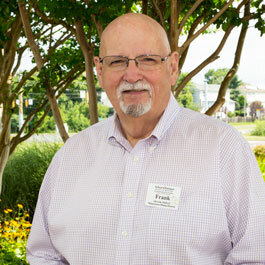 Had I known that senior care would become my passion, I would have switched to this career in a heartbeat, many years ago,” Frank said of his commitment to senior care. Frank oversees everything food-related, including quality, safety, and ensuring residents are consistently thrilled with the food. He plans special parties and snacks, and caters events. Frank is also charged with food purchasing, menu design, and training the food service staff. In his second role as Director of Facility Operations, Frank maintains everything outside the community building. He continually monitors the grounds for safety issues, and ensures everything always complies with county, state, and local regulations. He tirelessly works to make Arbor Terrace Sudley Manor comfortable, safe, and a true home. Frank says he loves making residents happy with delicious meals. He especially enjoys breakfast omelette bars, pancake dinner buffets, and monthly cooking demonstrations at the Bistro. Frank sees food as a way to emotionally connect to others, and he relishes the excitement on residents’ faces when they see the meals he’s dreamed up. Frank has earned the respect and admiration of many colleagues who admire his commitment and friendly spirit. Susan Haynes, Executive Director, admires Frank’s business acumen. “He brings a wealth of knowledge, experience, customer service, dedication, and professionalism to our community. His love, creativity, and passion for food shines through each and every meal and special event,” she said. We’d love for you to stop in and meet Frank. Learn more about our community or request a tour here.